In recent years, Macau community has raised its concerns of personal health and safety._ Before massive events are being held, many organizers would request the Macau Red Cross to provide on-site first aid service._ Macau Red Cross will prioritize the dispatch of its first aid team, according to the evaluation on the level of risks of the events. Hereunder are the conditions for requesting our first aid service, the tariff and the evaluation standards of the requested events. 1. Event organizer must be a local registered organization or recognized by the Macau SAR government. a) The event must be of social welfare purposes. b) Event organizer should send in written application, at least 14 working days prior to the event. c) Macau Red Cross will only accept the qualified applications, based on the results of evaluating the level of risk of the event, the potential number of participants and our grading (please refer to the following table). d) Due to our first aid team members are volunteers, service will be provided mainly on weekends and holidays. a) The basic charge of MOP4,800 is for a service of 6 hours or less._ Additional hourly rate is MOP800 for a service exceeding 6 hours._ Service for less than 1 hour is considered as 1 full hour._ Macau Red Cross will decide, according to the nature of the event, on the size of our first aid team, the utilization of first aid appliances and ambulance. b) Special offer: Non-profit social welfare events organized by Government departments, non-profit organizations and schools may receive a maximum discount of 75%. 4. All receivables from the aforesaid services will be credited to the Macau Red Cross Disaster Relief Foundation and Youth Development Foundation. 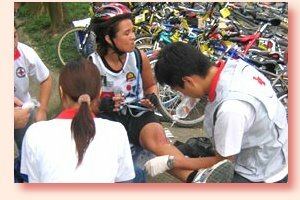 To ensure our first aid service is reasonable and effective to the general public, Macau Red Cross has categorized all types of events into Grade A, B & C respectively._ Grade A events will be considered as top priority to receive our service (Macau Red Cross reserves the right of final decision on prioritizing all applications). Grade C: Cultural and recreational shows, graduation ceremonies.